It is very possible Canadians are confused about what the Premiers want from the federal-provincial meetings taking place this week in Victoria, BC. A lot of it has to do with language and meaning. For example, some provinces are saying they want the new federal-provincial health accord linked to innovation. Innovation sounds great. Who would be opposed to innovation? Except what Nova Scotia’s Darrell Dexter means is very different from what Saskatchewan’s Brad Wall means when they use the word. To some, innovation is about having resources to invest in research and technology. To some, privatization is only about health services that are paid for outside the public system. To others privatization is any delivery of health care services by a private company whose fiduciary duty is to maximize profits for shareholders. That includes private delivery of public health care. The provinces don’t need the Feds to sanction private delivery of public health care services. We see more of it in Ontario than in any other province. They do need the cooperation of the Feds to get away with privatization that violates the Canada Health Act. With little interest by the Feds in enforcing the CHA, we’ve already seen how health care services can be “innovated.” When private clinics charge an annual fee for patients to access doctors who in turn bill the public provincial health plans for each visit, that’s what they are talking about. Right here in Ontario we have seen private clinics offer MRIs at twice the going rate the hospitals receive for the same service. That’s innovation too, mostly in profit-taking. We have plenty of jurisdictions around the world to see what happens under various privatization scenarios. So what exactly is being “experimented” with? We would argue the “experiment” is seeing how far a province can stray from the principles of the Canada Health Act before enough people cry foul. 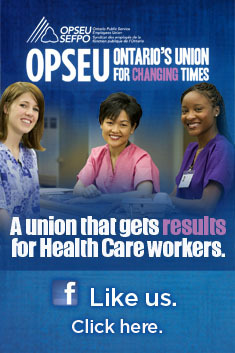 A few years ago OPSEU invited Boston’s Dr. Arnold Relman to speak in Hamilton. Relman is a former editor of the New England Journal of Medicine and professor emeritus at Harvard University. You might say he’s a guy who knows a thing or two about health care. Relman’s visit came at a time when Hamilton St. Joe’s was shuttering the last of its community lab collection facilities and handing the job over to the private sector. Relman informally told us that he didn’t think the U.S. would ever truly reform its health care sector because there were too many powerful vested private interests. His words were particularly prescient in the wake of the Obama “reform” that later took place. When Premier Brad Wall talks about this kind of “experiment,” it is unlikely he believes that the privatization genie could easily be put back in the bottle. An experiment suggests something temporary. This has the look of permanence. Yes, there are a few examples where the “experiment” didn’t succeed and the service returned to the public, such as private delivery of public home care in Manitoba by Olsten’s. No doubt the decision to terminate the experiment had much to do with Olsten’s fraud conviction in the United States. However, most of these “experiments” generally privatize and stay private. That’s the objective, and when the evidence doesn’t fit, government prefers to look away. The recent uproar over salaries at ORNGE came to light as a result of a Toronto Star investigation, not an interest on the part of the province in what was happening at the not-for-profit company. Dabbling in some for-profit commercialization, the executives at ORNGE argued that their lofty salaries should therefore remain proprietary — a secret. Several weren’t on the Sunshine List. What the Star found out was running an air ambulance service was netting ORNGE’s CEO almost twice the compensation of the highest paid hospital executive in Ontario. And then there were the now famous three o’clock smoothies. When we move to more private delivery, this is what we’ll get. These people will be erased from the Sunshine lists and we’ll be all left in the dark on how public funding is spent. There are many examples of Ontario already “experimenting” with private delivery. Like ORNGE, the current government gives little indication that it is interested an unbiased evaluation of such experiments. Some of the Premiers are arguing for innovation when they mean privatization. Then again, using the exact same language, some of them are also arguing for something quite different. Any wonder we’re confused? Maybe we’re supposed to be. This entry was posted in Health System and tagged Health Accord, Health care privatization, Premier's Meeting. Bookmark the permalink.